The main factory of the French metal packaging manufacturer Massilly in Cluny relies on extensive automation in the production process. Until recently the final process step, transporting the pallets to the warehouse, was conducted manually. 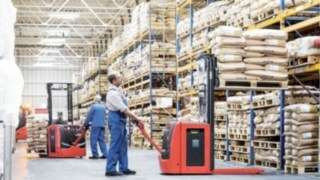 This task is now being performed by automated industrial trucks, with great success. Representatives of the company are now travelling to Cluny to see for themselves the benefits of Linde robotics equipment. Empty food cans on a roller coaster ride. Shining silver sheet metal parts are transported on seemingly endless conveyor belts through the spacious factory hall. In between, fully automated machines work on the details: printing on them, punching lids, shaping thin metal sheets, welding. There is a constant series of knocking, hissing, pounding and humming sounds that continues until the finished products are arranged on pallets. Cans may look like very simple everyday objects but they are actually technically very complex. Christophe Marteau is an expert on this subject: A can must have precise dimensions, be capable of withstanding sterilisation, and meet important requirements in terms of its mechanical load-bearing capacity. To achieve flawless products, Massilly employs specialists in various diverse technological disciplines, from engineers to chemists. The company has deliberately focused on automation for a number of years. “If we want to move away from the competition in emerging markets, we have limited options.” One option is quality. Another option is production processes that are as lean and interlinked as possible. He concedes that “while automation may not create any new jobs, it does protect existing jobs.” A factory that doesn’t invest in innovations will disappear sooner or later, says Marteau, standing a few steps away from a packing station. 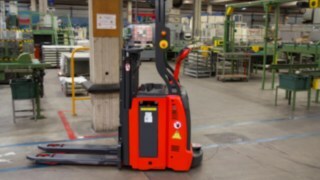 A palletising machine picks up boxes with finished products and loads them onto pallets. Next to it an automated pallet stacker is eagerly awaiting its turn. In addition the usual standard equipment this device has a navigation laser, safety sensors, a computing unit, a touchscreen and a Blue Spot. 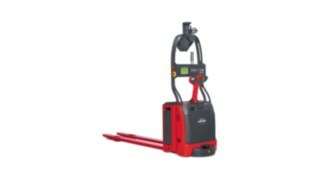 Once the robotic arm has filled a pallet, the Linde L-MATIC automatically clears the exit from the palletising machine, picks up the pallet, and places it a few metres away on an automatic foil wrapping machine. This is then followed by a similar process: The L-MATIC picks the pallet back up from the foil wrapping machine and transports it to the entrance to the high rack warehouse. It is not until this point that there is any human intervention again. Forklift operators pick up the pallets and place them into storage. Massilly’s main factory is located in the heart of the Mâconnais, a fertile and hilly landscape amid forests and vineyards. In the 1950s the business model of producing cans and lids from recycled tin plate emerged. 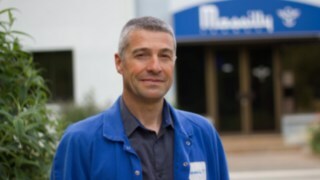 Today, Massilly operates 20 factories in 18 countries and employs some 1,300 employees worldwide. In France the company is a market leader in the field of tin lid manufacturing and is ranked third internationally. Thomas Bindschedler is the fourth generation of the family to run this company. Massilly is a ‘hidden champion’ in the truest sense of the word. From market leaders in the Italian pasta industry to industrial paint specialists, numerous manufacturers of branded goods rely on the French company for their packaging. “Couldn’t you have simply bridged the route between the packing station and the warehouse with a conveyor belt?” Marteau shakes his head: “We could have – but then important routes would have been blocked! 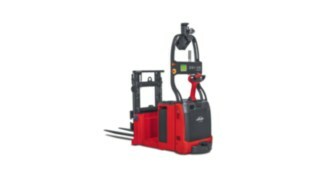 The Linde robotics equipment gives us total flexibility. 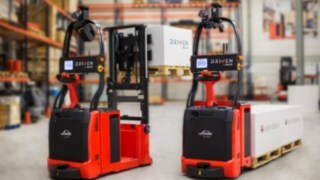 The roadways can be adapted at any time.” Thanks to geo-navigation systems from the French robotics specialist Balyo, self-driving pallet stackers can move independently around the space. They do not need laser reflectors, rails, magnets, or any other aids. Instead they use features such as walls, shelves, or pillars as reference points for orientation. 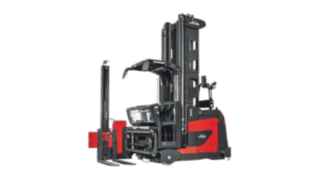 The forklift truck is familiar with the structure of the factory and reacts in real time if, for example, an employee crosses the roadway. 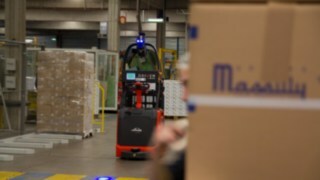 Warehouse employees also receive regular training on how to handle robotics equipment and were informed about the introduction of the forklift trucks in good time to bring them on board with the idea”, explains Marteau. Automated processes have now been a part of day-to-day life at Massilly for a long time. This is also true for the two employees who stand at the other end of the factory hall at a second loading station, an area which reminds you of a pit lane with parking bays. 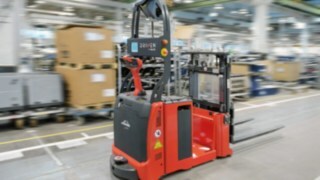 A latest generation Linde L-MATIC pallet stacker flashes by, drives in a curve, turns on its own axis and loads a pallet of colourful biscuit tins onto its prongs. The two warehouse employees watch the process carefully. “We have just made a correction to the foil-stretching machine. The operators are now checking whether everything is running smoothly again,” explains Marteau. 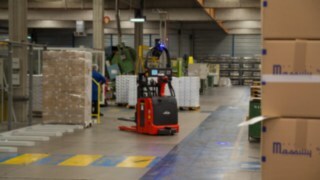 The first two automated pallet stackers were commissioned in 2012. 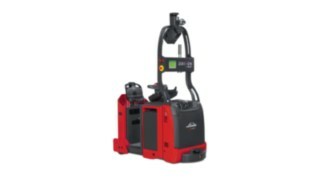 In spring 2016 two new L-MATIC devices were added to the fleet. It was an investment in the future. “In terms of our thinking, the fact that today we are using double the number of self-driving pieces of equipment supports our view that we made the right decision”, says Marteau. Operations are currently running more smoothly and the number of accidents has fallen considerably. 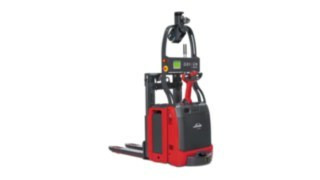 “Because Linde robotics equipment always drives the same, they are simply reliable,” emphasises Marteau. 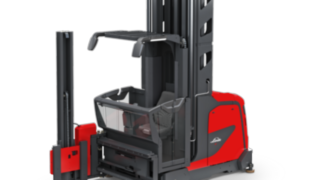 “Equipment operated by humans constantly require full concentration when starting up, manoeuvring or when estimating speed – and if a pallet falls all the boxes have to be unpacked and all the lids checked individually. This costs valuable time. The robot on the other hand never miscalculates.” Prospective customers from around the world visit Massilly in Cluny to look at the solution and ask Marteau about his experiences. The reason being that robotic products perform many standard tasks which can be transferred to other fields. 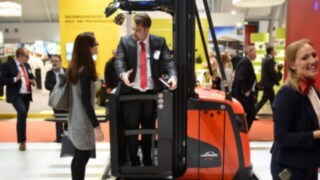 “Our warehouse also lends itself to automated industrial trucks,” observes Marteau. They are currently considering their implementation. 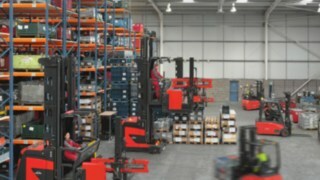 The robotic high-shelving retrieval device K-MATIC from Linde announced for the end of the year could be the ideal solution here.